“We have discovered around 13,000 asteroids and around 500 of them have a chance of hitting Earth,” he said. The new maps show a wide asteroid risk zone running through Europe, passing directly over Scandanavia, Germany, France and Spain. The US is largely unaffected, although Florida and Louisiana could be hit. South Australia is particularly at risk with several asteroid paths crossing the Lake Gairdner National Park and heading up towards Queensland. 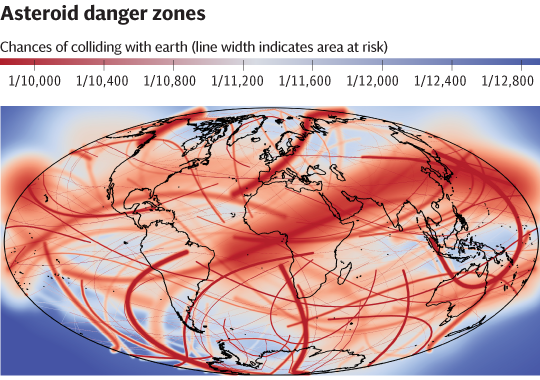 The asteroid impact probability distribution was also combined with the Earth population map to produce the global asteroid impact risk distribution which shows that south east Britain is one of the most at risk areas of the world. Dr Hugh Lewis, Senior Lecturer in Aerospace Engineering, at the University of Southampton, added: “It’s very easy to be flippant because of the Hollywood effect but it is a real risk. “When you look at global vulnerability Britain is at very high risk. You might think that is odd because we are a very small country but we have a high population density on the coastline so that means we are vulnerable to an impact in the Atlantic Ocean. "Small asteroids are hitting the Earth all the time, and even if we don’t anything large, we are still likely to have tens of thousands of people dying in the next 85 years. It has a similar death toll to other natural disasters. “This new software not only allows us to see where an impact is likely to happen but we also simulate what might happen if we tried to deflect it, such as by using a spacecraft to give it a slow push in space. The last large asteroid to hit Earth was the Tunguska impact of 1908 which felled 80 million trees over an area of 830 square miles, with the energy of 1,000 atom bombs. Had that fallen in central London it is likely to have killed everyone within the M25. The Chelyabinsk meteor which hit Russia in 2013 injured nearly 1,500 people. The research was released to coincide with World Asteroid Day, which was co-founded by Queen guitarist and astrophysicist Dr Brian May to raise awareness of the importance of monitoring space rocks. It is backed by more than 100 scientists and astronauts including Astronomer Royal Martin Rees and Richard Dawkins.